On William Shatner’s fourth album, he takes a deep dive into the realm of progressive rock. I believe the correct response to that would be, “what the hell?” Then again, Shatner’s musical career through the years has already been a steady flow of what-the-hell, hasn’t it? From the ludicrous The Transformed Man, where the actor dramatically read Shakespeare over pop music, to 2011’s hard rocking collection of science fiction-y cover songs on Seeking Major Tom. Both albums are both as enjoyable as they are ridiculous, whereas 2004’s Has Been was actually a pretty good album with mostly original material, where that perfect symbiosis between Shatner’s spoken word style and pop/rock music was finally met. Ponder the Mystery is more of that, but with a large dose of prog rock injected into it. The album starts off with the short instrumental opener Red Shift, before it begins proper with Where It’s Gone… I Don’t Know. This is also the moment where I initially turned the music off, shook my head and put something else on. For those first few minutes, you’ll find more vocal work by Billy Sherwood (of Yes fame, amongst other acts) than William Shatner, and that can be off-putting when you expect something else. Then again, what do you expect from the man who will always be known as Starfleet captain (and admiral) James Tiberius Kirk? In the end, the third time proved to be the charm. Once past Where It’s Gone… I Don’t Know (which incidentally proves to be the weakest song on the album, and quite a misfire as an opening track), things get better. A lot better, even. Ponder the Mystery oozes seventies progressive rock, which you might expect when you have the likes of Rick Wakeman (Yes), Steve Vai and Nik Turner (Hawkwind) collaborating. Shatner wrote the lyrics himself this time, and during the course of the album, he ponders life and death and overall existentiality in that dark, soothing voice you have come to know and love (or abhor) by now. More importantly perhaps, is that some of the songs here are actually pretty damn good. Whilst Shatner and Sherwood do tend to lose themselves in less interesting, overlong jamming here and there, songs like the title track, Change or Rhythm of the Night are very solid rock songs. You will also not be able to help yourself from laughing at Shatner’s intonation of “the rhythm… of… the night.” That’s some classic Shat taking the mickey out of his own career. Undeniable highlights of Ponder the Mystery also include the very catchy Deep Down and the downright psychedelic I’m Alright, I Think. 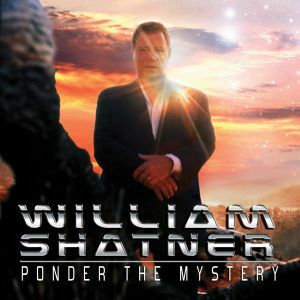 Ponder the Mystery is a strange beast, but we’ve come to expect that from Shatner by now. What still amazes me each time the man releases an album, however, is that it works, and on a number of different levels. When the music is actually good, Shatner’s spoken word lyrics fit like a glove, and you get an album that carefully balances on the edge between being outright silly, and the ability to offer something genuinely good. Either way, Ponder the Mystery is an album the likes of which you haven’t heard before. William Shatner really offers something unique here, like he has with his previous albums, and whether you love or hate it, he has definitely found his own distinct musical style. Highly recommend if you enjoyed the Shat’s previous quirky antics. This entry was posted in RP and tagged 2013, Billy Sherwood, Cleopatra Records, Ponder the Mystery, review, William Shatner. Bookmark the permalink.